Use cases such as controlling music, using as a device to control pictures and video, and home automation are growing. We expect the next round of product upgrades will lead to more first-time smartwatch purchases, as well as upgrades for those with existing devices. With the introduction of new devices, new features, and updates to hardware and operating systems alike, 2017 has brought a number of changes to the smartwatch market. As of June 2017, nearly nine percent of U.S. consumers aged 18+ owned a smartwatch, up almost 1.5 percentage points from the six months prior. Additionally, according to latest WEAR Report Industry Overview and Forecast from NPD’s Connected Intelligence, growth in the category will continue, with a nearly 60 percent ownership growth expected from Q2 2017 through Q4 2018, driven in large part by anticipated new product introductions from market leaders. This forecasted growth will result in nearly 15 percent of U.S. consumers aged 18+ owning a smartwatch by 2019. Increasing features and capabilities are key differentiators for smartwatches, which will further contribute to their growth over the forecast period. 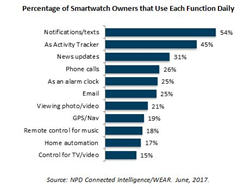 While use cases such as receiving notifications/texts, activity tracking, and news updates are still the most highly reported among smartwatch owners; use cases such as controlling music, using as a device to control pictures and video, and home automation are growing. In fact, 15 to 21 percent of smartwatch owners are already utilizing their devices for those types of activities daily. Currently, smartwatch ownership is controlled by the millennial generation, which has 13 percent ownership penetration, compared to just less than nine percent for the overall market. However, as use cases broaden, shifts in smartwatch ownership will follow. In fact, the male/female split in the category is now the lowest it has ever been at 60 percent male – indicating a more mainstream audience. Additionally, despite higher pricing than activity trackers, smartwatch ownership is highest among the lowest income category (less than $45,000 per year), with 34 percent of smartwatch ownership penetration. The results of the NPD Group Connected Intelligence Wearables Survey are based on consumer panel research that reached 5,000+ U.S. consumers, aged 18+ from diverse regions and demographical backgrounds. They reported on awareness, ownership, and intent to own various wearable devices. Additionally, consumers with awareness were asked follow up details including the features and functions that they expect to see in these devices. This survey was completed in June, 2017. NPD is the leading global provider of market information and business solutions covering brick-and-mortar, e-commerce, and emerging channels in more than 20 industries. We combine our unique data assets with analytic solutions to help our clients measure performance, predict trends, and improve results, advising them to help drive successful growth. Practice areas include apparel, appliances, automotive, beauty, books, consumer electronics, diamonds, e-commerce, entertainment, fashion accessories, food consumption, foodservice, footwear, home, juvenile products, mobile, office supplies, retail, sports, technology, toys, travel retail, games, and watches / jewelry. For more information, visit npd.com and npdgroupblog.com. Follow us on Twitter: @npdgroup.